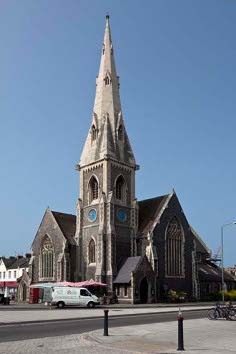 As befits a church in one of the smarter parts of early Victorian Hove, St John’s is lavish, built by W G and M E Habershon in 1851-54 (ESRO Par 387/10) in the Decorated style favoured by the Ecclesiologists. A later attribution to E Corfield (SAC 53 (1910) p270) is not substantiated by any contemporary source, but he could have played a part, as an architect of that name was staying in Brighton in 1851 (census records). The models were R C Carpenter‘s St Paul‘s and All Saints, Compton Avenue, but for all its pretension, St John’s falls well short. 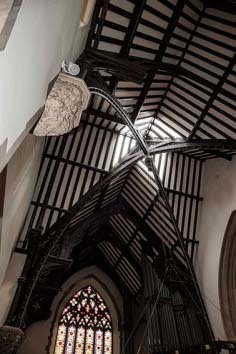 The detail is thin, e g the tracery of the, in some cases, over-sized windows, whilst the hammerbeam roofs of nave and transepts recall an earlier phase of the Gothic Revival, as do the crossed timbers with a pendant that mark the crossing. The best feature is the carving of the roof-corbels and on the chancel arch. In October 1853 (p267), The Ecclesiologist criticised the design roundly; though not mentioned, it cannot have approved of the gallery in the south transept. Its presence is symptomatic of the shortcomings of the design, which, as Goodhart-Rendel points out (AR 44 p28), is a compromise between the auditory church favoured by evangelicals and the tastes of the Ecclesiologists. When consecrated in 1854, the tower and stone broach spire were unbuilt and were added about 1870. In themselves, they are well proportioned, but too small for their position. In all, £8500 was spent (PP125). A small west porch (ICBS) was replaced in 1906-07 by a large triple one, with angled outer arches, by H C Rogers, C B Bone and F A Coles (B 93 p174). 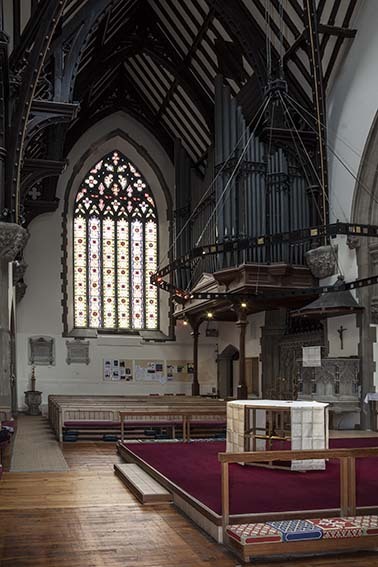 In 1981 the south aisle was partitioned off to make a local authority day centre and this was extended to include the entire nave in 1995. 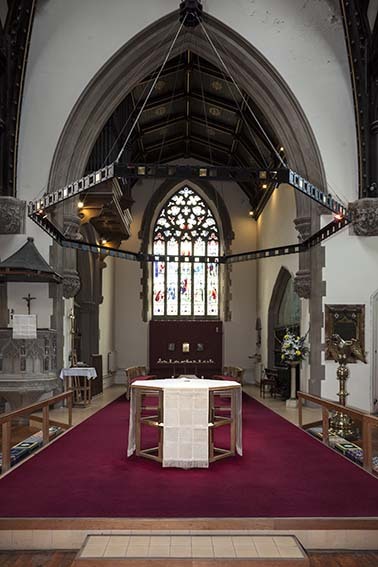 In the previous year the eastern parts of the church were re-ordered by J Small (Antram and Morrice p123) around a central table under the crossing. Font: (In separate baptistery) Small and octagonal. 2. 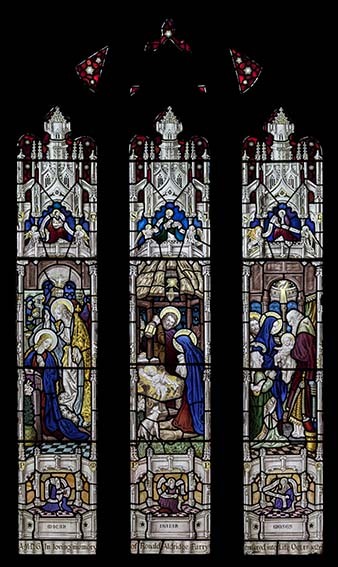 (East and north aisle west and fourth windows) A L Moore and C E Moore, 1926-27 (WSRO Fac 2931). 3. 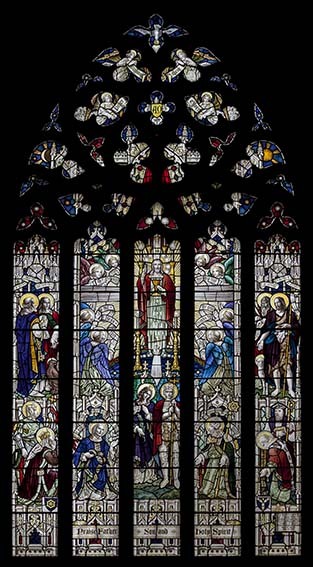 (South chapel east and first and second windows and north aisle first window) Ward and Hughes, 1924-27 (ibid). Pulpit: Stone and elaborately arcaded with flamboyant tracery. Screen: (North transept under organ) Stone and clearly related to the pulpit.